The prologue begins with a violent reinterpretation of Batman’s beat-down of Alberto Falcone during Labor Day, but this time from Falcone’s perspective. 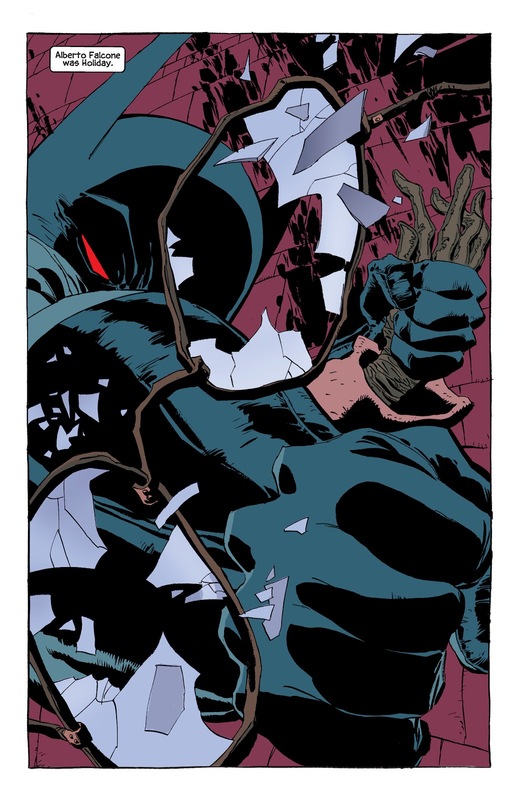 Apparently, Batman did more long-term damage to Alberto than initially thought, as it is revealed that his right hand is permanently crippled. Alberto’s right hand is non-functioning now, because of Batman. We also are introduced to the most important new character: new Gotham City District Attorney Janice Porter. Porter is trying to free Alberto, a fact that Commissioner Gordon hates. Despite this new complication, Batman insists that he is fine. When Gordon reminisces about Harvey Dent, Batman coldly tells him to stop. 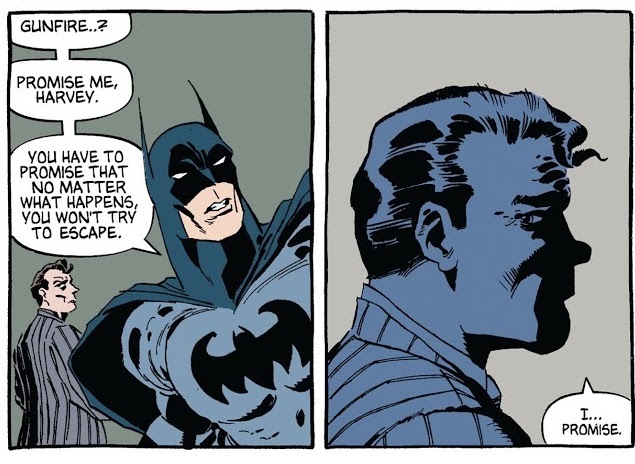 Gordon is appalled at Batman’s insensitive response. Gordon berates Batman for being so cold about Harvey Dent. Because of what happened to Dent, Batman feels isolated. Ironically, this leaves his only friend Gordon alone and lonely as well. 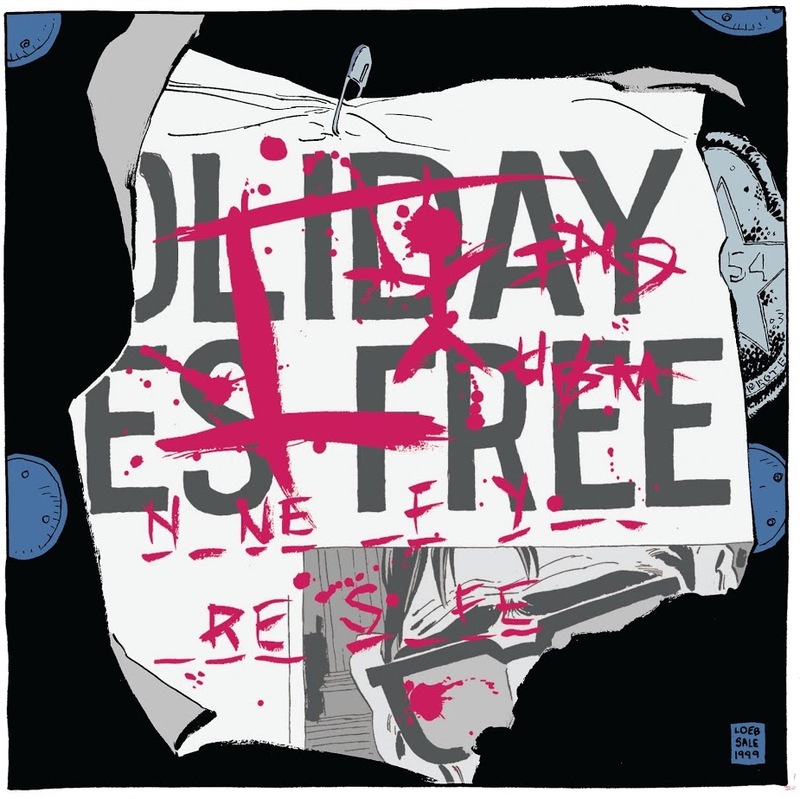 Dark Victory‘s predominant theme is stated right at the opening: “I am alone”. Bruce Wayne gives the thesis of the whole series immediately. 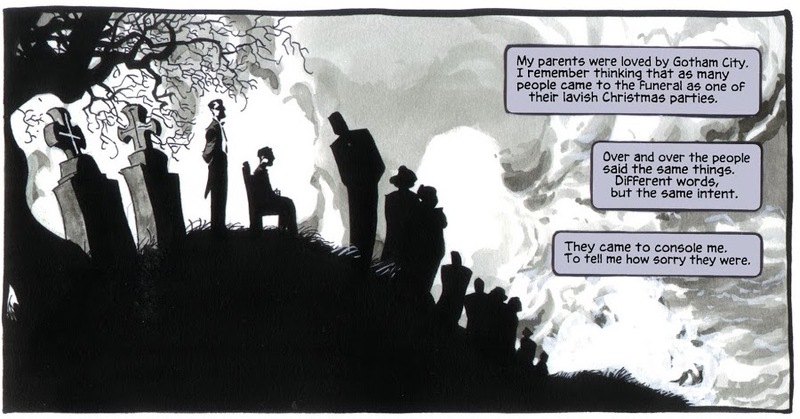 It starts as a flashback of young Bruce seeing his parents gunned down. Being at the mercy of the mugger creates a sense of loneliness that carries with him even as an adult. At the funeral, the long rows of his parents’ friends comforting him does nothing. Sale makes this particular funeral scene surreal. The shadowed rows of the Waynes’ friends unrealistically bending over the curvature of the hill with a creepy tree in the background has an almost nightmarish quality. It is unrealistic and vaguely resembles a Tim Burton drawing. 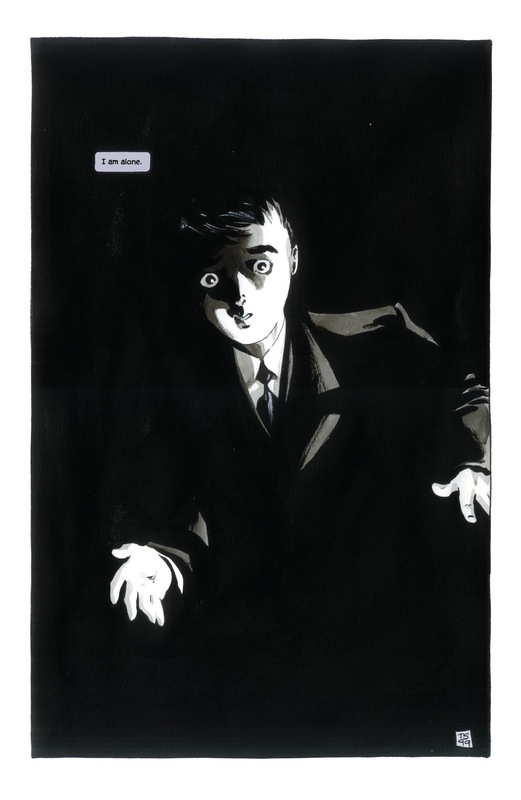 Sale emphasizes the nightmare-feeling of Bruce’s childhood with exaggerated visual elements. Sale has always been a stylistic, impressionistic artist. His proportions are unrealistic at times. He does not try to evoke photo-realism, but draws based on maximizing the mood or drama of a scene. This panel is a perfect example of Sale’s art style setting a creepy mood that feels unearthly. Flash-forward to the present, where Batman is watching the remaining gang lords attend a memorial for Carmine Falcone. Amongst in attendance is Selina Kyle wearing an inappropriately-short dress. “It’s hot. But, not as hot as the night Johnny Viti got married,” she slyly smirks in a callback to the beginning of The Long Halloween. In fact this chapter is full of callbacks and repeated narrative beats to the first issue of TLH. 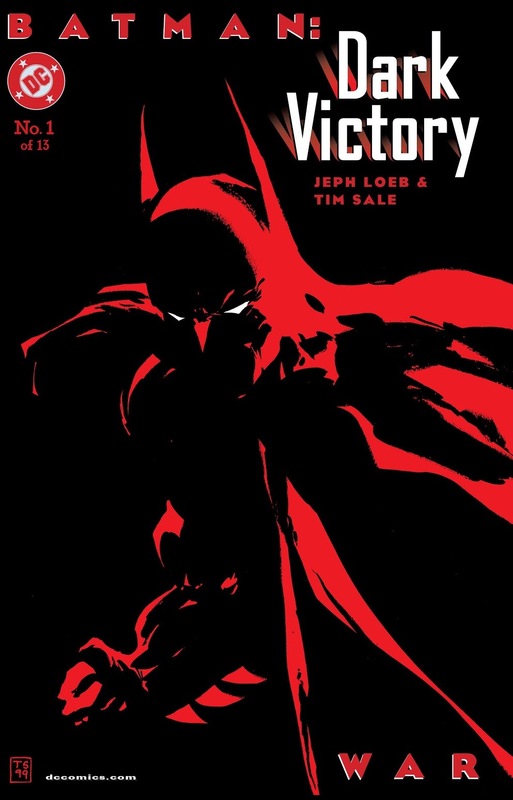 In both the start of Dark Victory and its predecessor, Bruce makes a statement that becomes the running thesis for the rest of the series. 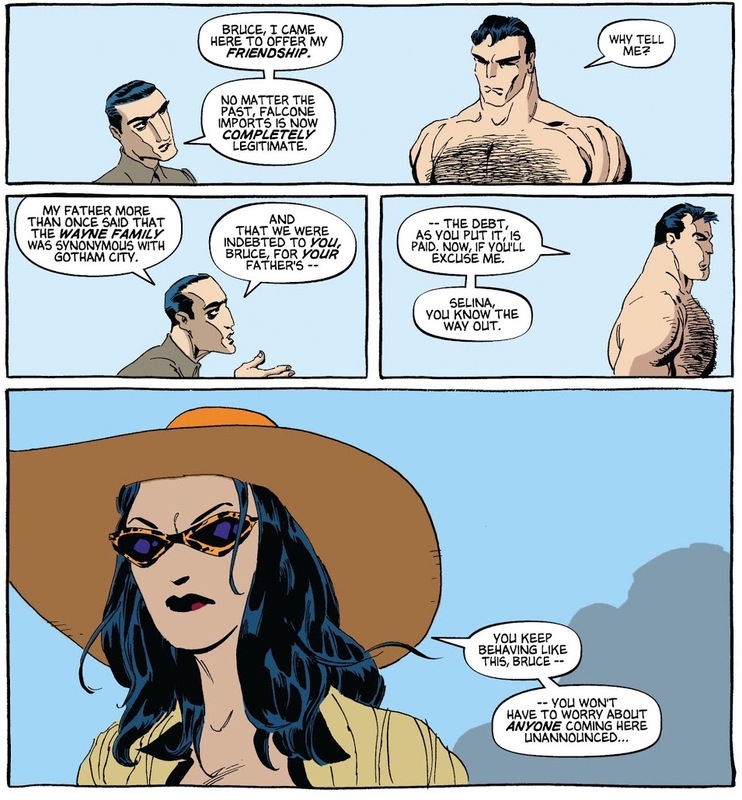 In TLH, it is Bruce’s line, “I believe in Gotham City.” Here, Bruce emphasizes his loneliness. 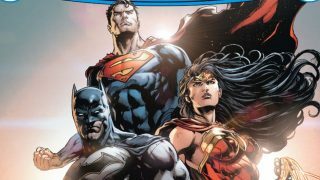 Both comics have a catalyst that gathers all the main mobster characters together. Catwoman and Batman have a brief fight before escaping the mob, and of course, both comics start a murder mystery. After cops arrive to investigate the shooting at Falcone’s memorial, Chief O’Hara reads the words written on the gravestone. “Vinny, Veedee, Vicky…What’s that supposed to mean?” O’Hara asks Gordon in his characteristically obtuse fashion. Nice to know that O’Hara’s personality is consistent across here and the Adam West Batman TV show. An ironic statement for the Falcone family. “I came, I saw, I conquered.” A line that sums up Falcone’s life as a crime boss. However, it is also an ironic, foreboding statement of the Falcone family’s eventual fate. Speaking of Falcones, a new Falcone brother is introduced: Mario Falcone. Mario recently returned to the United States and now allegedly runs Falcone’s Imports completely legitimately. Not that Bruce Wayne cares. Just like he did with Gordon earlier, his trust issues push potential allies like Mario and Selina away. Bruce pushes Selina and Mario Falcone away. Similarly, we find out just how isolated Gordon truly is. His family has left him and his wife refuses to even talk to him. A fact that is visually emphasized by Gordon at his desk, surrounded by darkness. 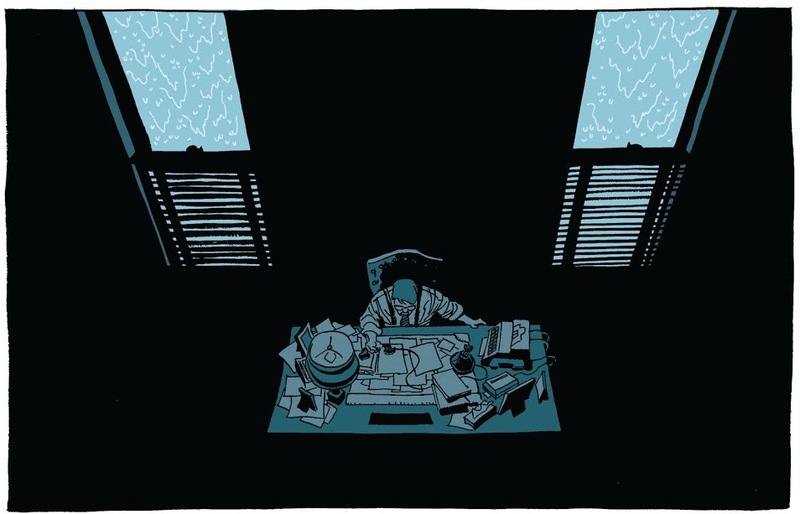 Gordon’s loneliness is heightened by showing his small desk surrounded in a sea of blackness. This is feeling of Gordon being isolated is reiterated when he talks to Batman. When Gordon makes the mistake of bringing Dent up again to Batman. But, Batman does not reach out or even responds to Gordon. He abandons Gordon, leaving him physically and emotionally alone. Catwoman calls Batman out on his jerk behavior, but then gives him a tip that Dent is targeted for assassination tonight. At Arkham Asylum, Batman implores Two-Face to return to a normal life. Here, Two-Face seems to give glimpses of hope that Dent is still within him, only to quickly reverse his statements. This back-and-forth dynamic that Batman and Two-Face have carries through the entire series. There is a running theme of acceptance of change in Dark Victory. It is acceptance of changes that occurred in people or events – bad and good – will be this way from now on. It is pervasive in the mob’s plot to regain control of Gotham from the super villains. Since the end of TLH, super villains have more or less taken over Gotham’s crime scene. But the Falcone family refuses to reconcile with this power shift and will spend the rest of the series fighting against it. Here, Batman struggles to accept that his old friend Harvey Dent is gone and Two-Face is all that is left. 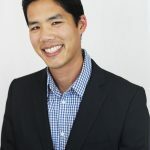 However, he continues to reach out, or give Dent the benefit of the doubt. So, when Two-Face promises to not escape, it is slightly heartbreaking, because Batman is still holding on to some sliver of hope. Two-Face’s true motives are not fully clear. It is effective because, at this point, readers are not fully sure of Dent’s state of mind, because he is constantly arguing with himself. 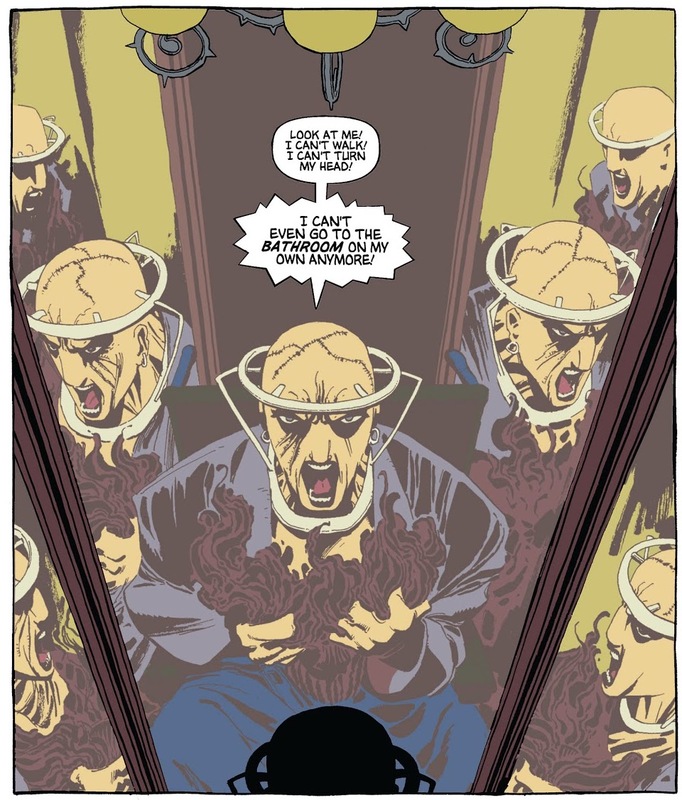 Loeb seems to play up the whole split personality aspect of Two-Face more in this series. He is literally at odds with himself. Despite Batman’s best efforts to stop an Arkham outbreak, Two-Face escapes. Batman visits a still-living Sofia Gigante Falcone. Except she is no longer the imposing body of power. After her fall from the window from the ending of TLH, Sofia is now wheelchair-bound and wearing a halo-traction brace. Seeing how pathetic Sofia now is, Batman leaves. Sofia Gigante is a shadow of her former self. Over the course of the next couple days, Mario and Porter successfully get Alberto out of Arkham and on probation. However, Alberto’s release seems to have started a chain of successive events. First, Falcone’s grave site gets smashed. 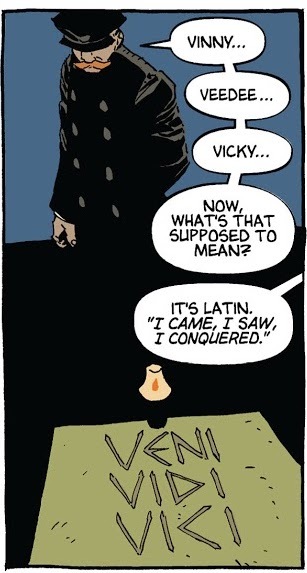 A hammer literally destroys the words “Vene, vidi, vici”, casting a dark shadow of ill omen over the whole Falcone family. Then, Sofia receives a package containing her father’s severed ring finger. Falcone’s finger is mailed to Sofia as a message. Gordon and Porter find her office in ruins and Harvey Dent’s case files missing. And, finally the hanged body of Chief O’Hara is found dangling on a bridge with a note pinned on the body. Loeb and Sale masterfully crafted another opening piece. The team does an amazing job setting up the new status quo, characters, and laying the foundation for future plots. 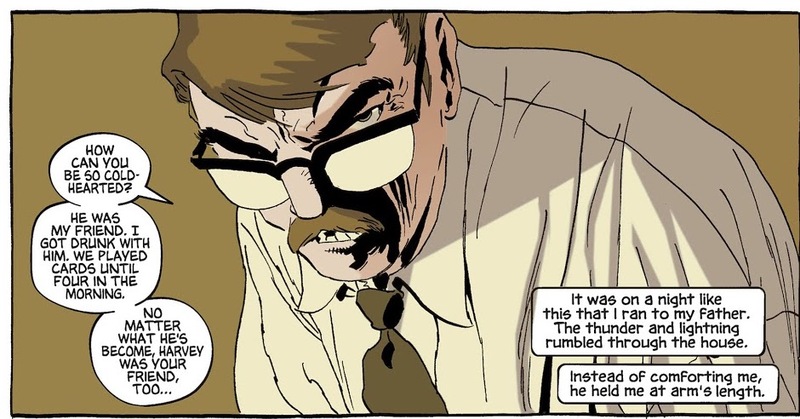 Dark Victory acts like a continuation of the events of TLH. 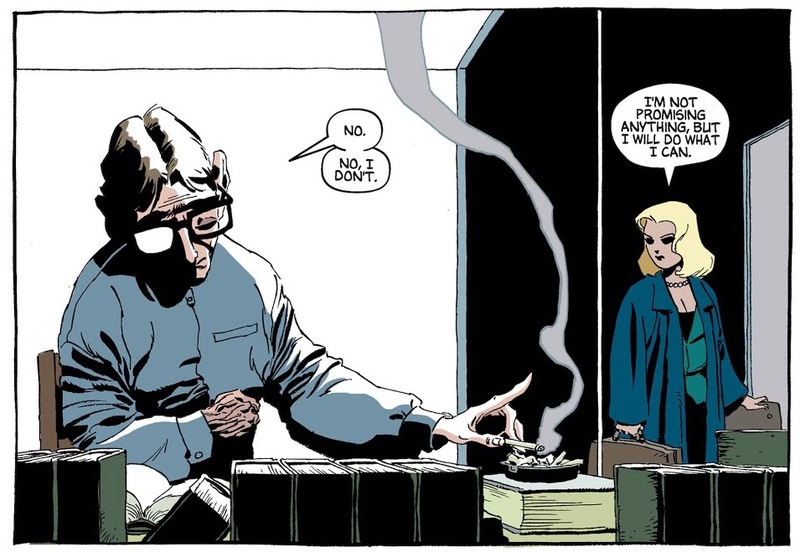 The motif of acceptance to change and loneliness works wonderfully, because it is a natural extension of the themes that Loeb was using in TLH. 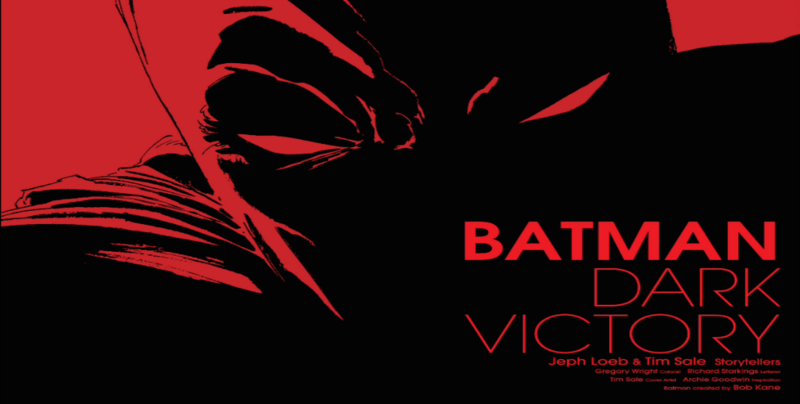 Dark Victory is intriguing and has forward momentum from the outset.